Taste test: These chips were a major hit around the chip bowl, ranked by some among the best chips ever. The main reason seemed to be a thoroughly excellent flavor — lots of great chili taste and even an impressive kick of heat. Beneath all that great flavor, the underlying chip was quite nice as well, with a light, crispy crunch on a fairly thick chip. The bag emptied quickly as people enjoyed chip after chip. The heavy amount of seasoning did leave behind quite a bit of residue on people's fingers, so be prepared to lick yours for some extra flavor later on, or else bring along a good, absorbant napkin to keep yourself clean. Smell test: Nice, but very mild, baked potato smell. 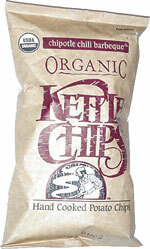 Trivia: Even though the chips were largely unbroken, the bag was more than half empty. 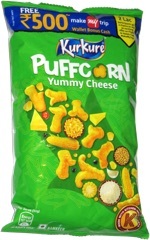 This snack was discovered by Al Roker Productions at Whole Foods Market (formerly Bread & Circus). Review published .